Front Page article in The Standard! Today's St. Catharines Standard featured a front page article about occasional teachers, featuring our very own Britiny Gentry! 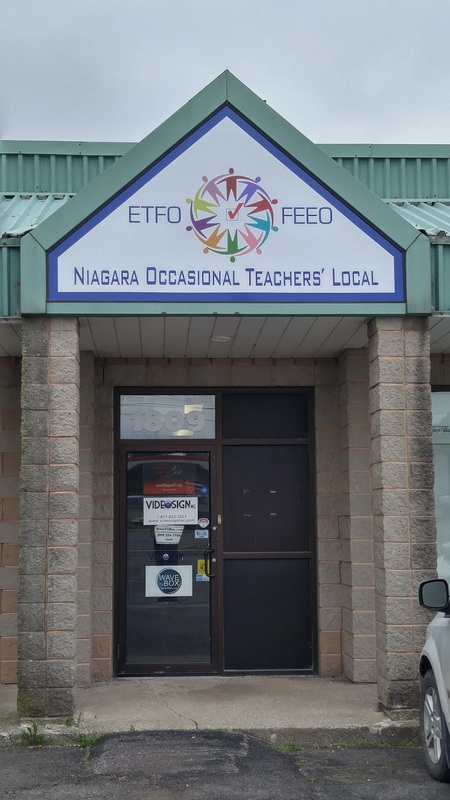 ETFO Niagara Occasional Teachers' Local is a Lifetime Member of, and annually donates to, the Education Foundation of Niagara's Poverty and Emergency Relief Fund. These funds support things like breakfast programs and other areas where students may have need. ETFO Niagara Occasional Teachers is a member of Canadian Blood Services' Partners for Life program. Family and friends are also welcome to participate. To participate, simply sign your name under our organization in the Partners for Life log book located at reception when you donate blood. Once you have received your blood donor card, you can also register online so that all your donations are automatically linked to ETFO Niagara OTs. Our Partner ID is ETFO008261. Blood donations directly help patients being treated for cancer, during surgery, or after serious accidents. Each unit of blood donated can save up to three lives! Mondays 4 p.m. – 8 p.m.
Tuesdays 9 a.m. – 1 p.m. & 2:30 p.m. – 8 p.m.
Wednesdays 9 a.m. – 1 p.m. & 2:30 p.m. – 8 p.m.
Thursdays 8 a.m. – 12 p.m.
For more information, call 1-888-2-DONATE (1-888-236-6283). If you're on an LTO of 90 calendar days or longer, you can find information on the ETFO Employee Life and Health Trust benefits plan at this site. While our contract does not give us benefits for daily OTs (if you're in an LTO, look here), it does include $4.55 per day in lieu of benefits (Article 16.01). Unfortunately, that doesn't buy a whole lot. If in a good year you teach 100 days, that will give you a monthly budget of $37.92 for benefits, which quite frankly won't even pay the monthly fee for a single person to buy a very restricted guaranteed issue benefit plan. Purchasing full benefits: A full benefit plan (medical, dental, drugs) is your best option, but there are two main caveats. First, a full benefit plan can be expensive. You can expect to pay anywhere from $80-$400 per month depending on your age and whether you need single, couple, or family coverage. Second, if you have any pre-existing conditions, you'll have to disclose them on a medical questionnaire and coverage for those conditions may be denied. Guaranteed issue plans: A guaranteed issue plan does not require a medical questionnaire, and your pre-existing conditions will be covered. Guaranteed issue plans are also relatively inexpensive, starting at about $63 per month for singles. Unfortunately, guaranteed issue plans offer very low caps on their coverage, such as $500 per year for prescription drugs. However, if you're relatively healthy, a guaranteed issue plan can give you some supplementary medical coverage at relatively low cost. Trillium Drug Program: The Trillium drug plan is offered by the Ontario government to people with low incomes and high prescription drug costs. Depending upon your income, they establish an annual deductible, and once your prescription costs go over that deductible, Trillium kicks in and your prescriptions will only cost $2.00. You can sign up for the Trillium drug program even if you have another benefit plan; if your plan doesn't cover 100% of your drug costs, you're eligible for Trillium. Trillium is a very good option for occasional teachers who have regular prescription expenses. If you choose to rely on OHIP and Trillium alone, then you should still purchase a travel health plan. If you ever leave Canada, even just to cross the border for shopping, then you'd be crazy not to purchase a travel plan. Travel health insurance is very inexpensive, and if you ever experience any medical needs while outside Canada, it can easily pay for itself thousands of times over. Unless you're planning a particular trip of a long duration, your best option may be to purchase an annual multi-trip plan. A plan offering an unlimited annual number of trips up to 15 days in duration will cost you less than a hundred dollars per year for a single person, and less than two hundred for a family. Ontario teachers have a unique option available to them for purchasing insurance. The Ontario Teachers Insurance Plan (OTIP) is governed by a board of trustees with representatives from each of the teacher federations (ETFO/OSSTF/OECTA/EAFO). Because of this, OTIP offers products exclusively oriented towards teachers, and operates part of its business on a non-profit basis. OTIP offers a full line of products from health and dental to home and auto insurance. If you're in need of counselling support, you can call COAST Niagara 7/24 for help and information at 1-800-263-4944. The Niagara Health System and Niagara Region Public Health also offer a wide variety of group sessions that can be very helpful. There is also a list of Niagara resources here. This is your contract. Read it, know it. Keep it with you, and don't be afraid to assert yourself and insist on the working conditions we've negotiated for occasional teachers. Note that our contract for 2014-17 originated in three documents: Collective Agreement 2008-2012, which is modified by the 2014-17 Local Agreement, and the 2014-17 Central Agreement. If you have a collective agreement question it's probably most efficient to contact president@niagaraot.org with your question. Add 1% on September 1, 2017. Add 1% on September 1, 2018. Add 1% on February 1, 2019. Add 0.5% on August 31, 2019. Note that if you do not have a QECO rating on file with HR at the beginning of an LTO, then you will be paid at category A1. You can claim $350 per school year (July 1st to June 30th) towards AQ courses or other PD expenses you incur. Last amended at the 5/29/18 Local AGM. Last amended at the October 2017 Local Executive meeting. In an election year, or between elections if there has been a call to fill vacancies, this is the form you use to express interest and to nominate yourself to serve on the Local Executive. Complete this form to be honoured at our Annual Meeting when you reach a career milestone. This is a letter you can give to any teacher who is uncertain whether they're allowed to provide you with a reference letter. It provides the definition of Professional Reference agreed to by both DSBN and the Local. This document sets out the ethical standards and standards of practice for the teaching profession in Ontario. This is a must-read, prepared by ETFO legal counsel. Copyright Matters! A guide to Canadian copyright for teachers. Poster advertising this web site - please post in staff rooms. Occasional Teacher wallpaper for your computer. More to follow... what would you like to see here? Receive up to $350 per school year towards Professional Learning! Download the PL Reimbursement Form (You can use Foxit PDF Reader to fill in the form. Please note that cheques are not issued until after the course has been completed.) Win an Android Tablet! When you attend PD workshops as well as our Fall General and Spring Annual meetings, you'll have the opportunity to enter a ballot to win an Android tablet at our Annual meeting. The more you attend, the better your chances! Win a Free AQ Course! Attendees at our Local Annual General Meeting will have the opportunity to win a fully subsidized AQ course. You have to be present at the meeting to win! Watch your e-mail and the eNewsletter for PL opportunities and social events! ETFO also offers several provincial conferences throughout the year. DSBN workshops (posted in staff rooms) are open to occasional teachers. You can register for them by visiting PD Place. Edubuntu - Ubuntu Linux customized for educational uses. OpenSource.org - explains what free, open-source software is all about. The above form signs you up for our MailChimp mailing list, which lets us make nicely formatted newsletters. NOTE: Non-DSBN e-mails only! DSBN e-mail addresses will be removed, as our employer monitors e-mail. NiagaraOT-Announce: This group is where important notices and information for all occasional teachers is posted. We ask that everyone please join this list. If you have difficulties signing up with the instructions above, send an e-mail to president@niagaraot.org and I'll send you an invite to the groups that should simply require you to click to confirm joining. If you are not ALSO subscribed to our NiagaraOT-Announce e-mail announcement list, please do so via the sign-up box on our e-mail groups page. The ETFO-OT office is located in the Petro-Canada plaza at the corner of Highway 20 and Merrittville Highway. If you're coming from the 406, turn left at Merrittville Highway, then enter the plaza and follow the laneway around the gas station to the other side of the plaza. There's lots of parking on either side of the plaza. The Federation provides legal assistance to defend members against allegations that are related to the member's teaching duties or employment responsibilities. - Do not participate in or consent to an interview. - Make no statement to anyone regarding the allegation/charges. - Say "I am willing to cooperate but I am unable to comment until I contact the Federation and legal counsel." - Call ETFO professional relations staff at 1-888-838-3836 or 416-962-3836 and state that your call is urgent. If you are in need of immediate support or help finding resources, you can call the COAST Niagara 7/24 crisis line at 1-800-263-4944. The Niagara Health System and Niagara Region Public Health also offer a wide variety of group sessions that can be very helpful. There is also a list of Niagara resources here. You can also call Access Line Niagara at 1-866-550-5205 for referral to community mental health and addictions resources/services.